Exclusive use of one of three Meadow locations and the Visitor Center for up to 8 hours. Built in 1869 as a business venture for the Shakers, the South Union Hotel catered to people of “the world,” Victorian railroad travelers who stopped at South Union. One of the last surviving 19th century railroad hotels, South Union Hotel boasts three dining rooms, an enclosed sun porch, and a large catering kitchen. exclusive use of the 1869 South Union Hotel (first floor) and grounds for up to 8 hours. The South Union Hotel can be rented for corporate functions at an hourly rate. This venue offers a private space for your event in a unique and historic environment. Corporate clients will enjoy the ease of planning their event with hands-on event staff. South Union can provide audio/visual equipment for your meeting or event. Do you have a bride’s room? SUSV can provide space for the bride and wedding party to dress. Renters who have paid a deposit on a rental at SUSV may take photos outside and on the porches of historic buildings prior to and during their event at no additional charge. Does SUSV provide tables, chairs, linens, and serving ware? All tents, tables and chairs, linens, and serving ware must be furnished by the renter. SUSV provides wooden chairs, square tables, and rectangular tables at no additional cost with any rental of the hotel. These items are to remain indoors. All linens, china, flatware, tents, or any items for outdoor use must be furnished by renter and can be rented from an outside vendor. Should the renter prefer to use different chairs and/or tables inside the hotel, SUSV’s tables and chairs can be removed from the building by staff for a small fee. Any style of decorations may be used and must be free-standing. No decorations may be fastened using tape, nails, tacks, etc. 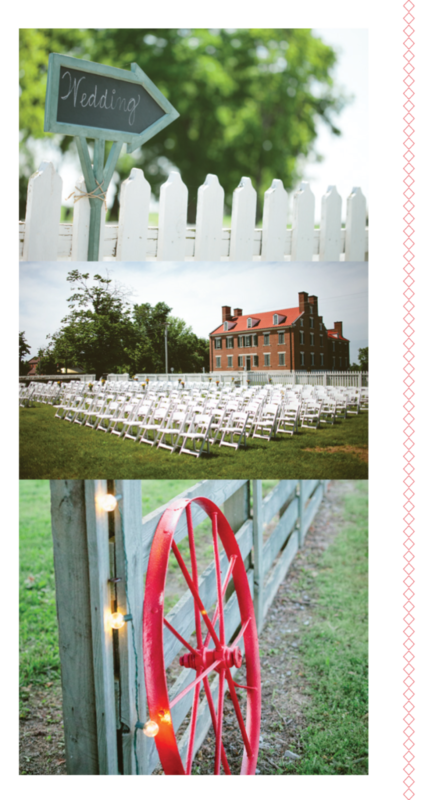 NO decorations will be allowed on any historic structures at SUSV. Candles and open flames are strictly prohibited. Bubbles, butterflies, real flower petals and birdseed may be thrown when the couple departs. All decorations must leave with you at the close of your event. Does SUSV provide audio/visual equipment? South Union can provide audio/visual equipment for corporate events only. Access to outlets and wattage is limited due to the site’s historic nature. Live or recorded music may be played indoors or outdoors. Please check with SUSV regarding your electricity needs. Alcohol may be served to adults 21 and over by a licensed bartender ONLY. Special accommodations must be made if alcohol is to be sold. Does SUSV have a list of required caterers? SUSV welcomes licensed and insured caterers. The renter must submit a copy of the caterer’s current liability insurance certificate to SUSV. For renters who wish to handle food service themselves, special event liability insurance must be purchased and a copy of the coverage submitted to SUSV. Who is responsible for setup and cleaning? All setup, renter cleanup, and deliveries/pickups must take place within the hours allotted by the rental package. The renter is responsible for all setup. Setup and teardown will take place within the hours rented including: tents, ceremony chairs, sound equipment, etc. Renters must clear all scheduled delivery and pickup times with SUSV. At the South Union Hotel: tables and chairs owned by the site will be staged inside and/or removed by SUSV staff. All renters, delivery personnel, and guests must park in the gravel lot or the grassy meadow at the Visitors Center. No parking is allowed near the historic buildings. We recommend using a golf cart for the convenience of guests with limited mobility. For scheduled deliveries, personnel may drive onto the property and remain long enough to deliver their equipment only. Parking is located in the gravel lot behind the hotel and across the street at the store. The required departure time will depend on the rental package you have chosen and the number of hours it includes. However, regardless of start time, all rental events must end by 12:00 midnight. The renter and all related guests and staff must be off the property by the designated end time or a fine will be charged. Please schedule your event to end at a time that will allow sufficient time for clean up, pickup of equipment, and departure of all guests and support personnel. What happens if I have an outdoor event and it rains? SUSV recommends renting a tent should rain be in the forecast. If anticipated attendance does not exceed maximum capacity (120 standing) the ceremony may be moved into the hotel (if available). However, if you do not rent a tent and your event exceeds the maximum, the event will need to be moved to an offsite location.